Hi there. I'm late. Sorry about that. The boy has had the flu all week... He's quite ill... So my attention has been elsewhere. But, I squeaked out a post, thank goodness. Shall we get to it? Let us go. Welcome to the third installment of Series 4 - The Candy Wrapper Chain! To see what fun I've been having with these nifty chains, visit my previous entries in the series: Installment 1 and Installment 2. How I've used the chains as a frame in a couple of different projects. 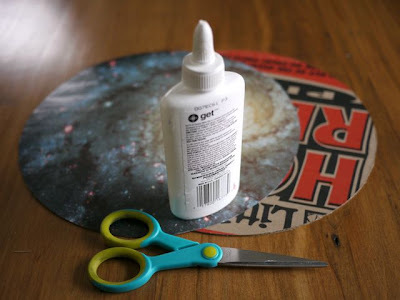 How to make the rosette I first made in Installment 1. 1. Using junk mail, or phone book pages, cut out narrow sheets. Mine are 3-3/4"(9.2 cm) wide (this measurement allows me to get 2 strips from 1 phone book page, but I make all my strips this width for consistency's sake). 2. 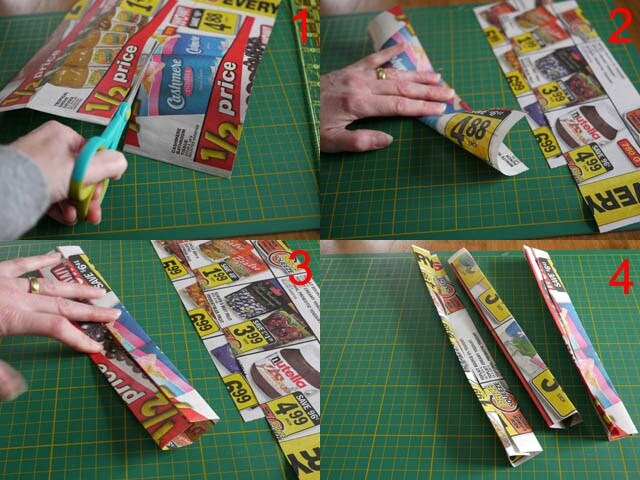 Fold a strip in half lengthwise. 3. Unfold the strip, and fold the long edges in so that they meet the center fold. Refold in half lengthwise. 4. 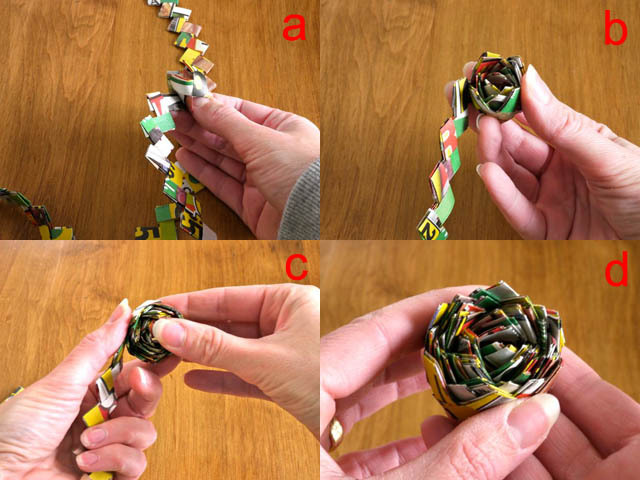 Fold all your strips in this way. 5. Mark a strip at increments of 3/8" (1 cm). 6. Clamp several folded strips together using a clip. 7. 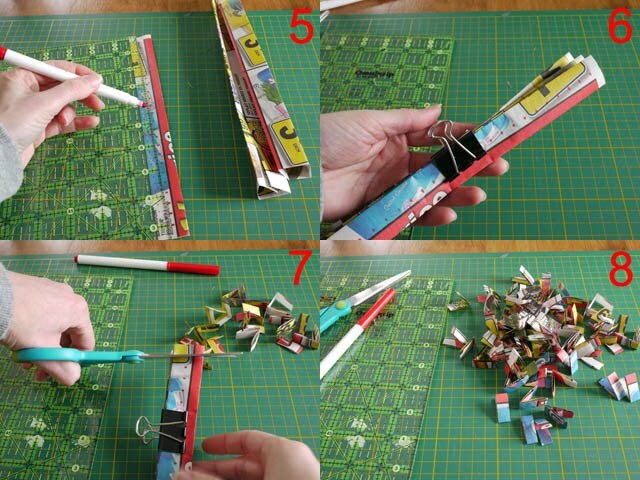 Make links by cutting through all the folded strips at the marks you made. 8. You'll get many many links in no time. Now you have everything you need to make the chains. Here's the video tutorial that shows how to do that! It's surprising how long a chain you can make during an hour-long TV show... Have fun! 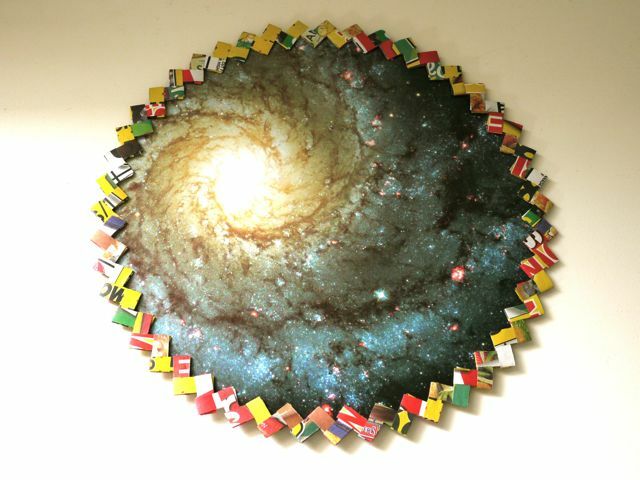 For my first project, I cut a slightly larger than plate-sized circle from one of the months of an old astronomy calendar (could not throw it out... could not). I also cut a similar circle from a pizza box. 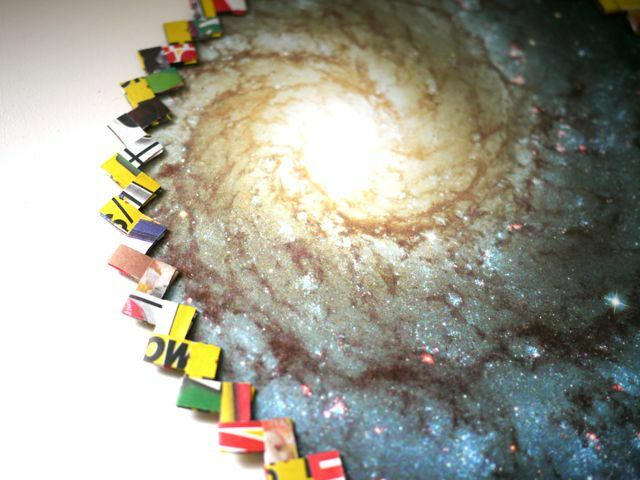 Then I glued those two circles together. 9. To frame my picture, I took a chain. 10. After placing a plate in the middle of my calendar picture, I applied a bead of white PVA glue around the perimeter of the circle. I then placed my chain on the bead of glue using the plate as a guide to keep the chain along a nicely circular path. 11. I trimmed the chain and inserted the end links into each other and glued them in place. 12. I removed the plate, and voilà, a picture framed! The "framed" astronomy calendar page will decorate the closet door of the boy's bedroom. I'll be making a few more of these to create a unique astral door decoration! 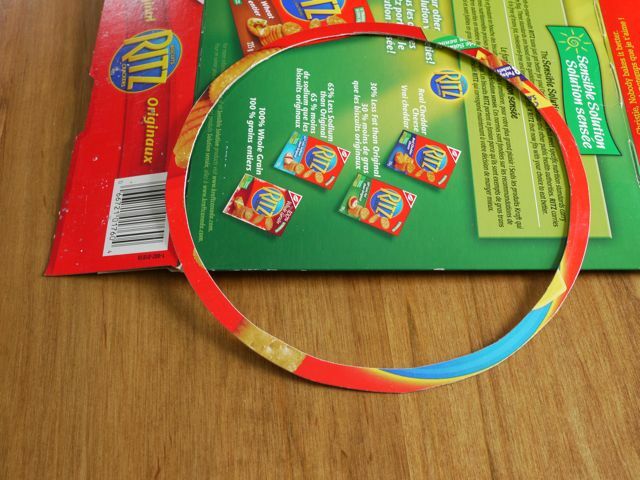 For my next project, I cut a circular ring out of a cracker box, and glued two chains to it. 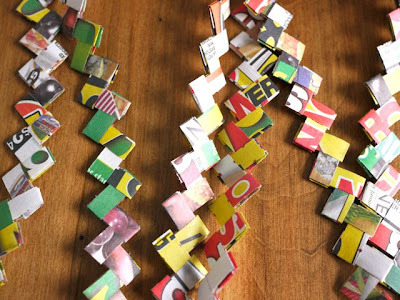 ... creating a sweet telephone page candy wrapper chain wreath! I can imagine adding a few coats of paint to this wreath and framing a round mirror or a simple clock face with it, can't you? The possibilities never end, do they? Have a healthy weekend and I will see you again soon! I'm sorry to hear that your little guy is sick. The flu landed me in the hospital one year. Keep him hydrated! I hope you and your husband stay well. Oh i do hope he is well soon Michele....love your tutorials. I like your chains, but i like more the astute way you make them!!!! Ohh,i wanna say thnx to you also,you write lovely comment about me on my feature at Mod Podge Rocks blog..
Melhoras. Gripe é terrível mesmo. Olha, esse trabalho me remeteu a lembranças belíssimas da minha vida...Da minha mãe!!! Ela fazia muito e eu ficava encantada. Dá pra fazer coisas lindíssimas. É só das asas à imaginação e voar. 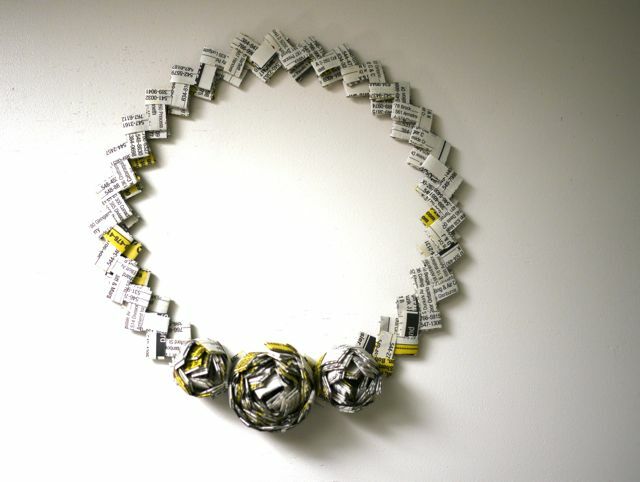 The last wreath is my favourite, especially with the little pops of yellow from the phone book pages. And of course, the rosettes are fabulous. p.s. Have you heard of Greencraft magazine by somerset studios? They have an ongoing feature called from the bin, I think you should submit your projects. I have never been able to make these right. There are such possibilities with paper and chain. Thanks for sharing another idea. I think I may have to give it a try again. I hope your little guy gets better soon!!! I just love these! Especially the rosette wreath!! Very nice! I like the lampe. Oh, poor little dude, hope he starts feeling better asap. These are lovely, the flower wreath is completely WOWZER!!! Just love thewreath you made! Beautiful! Hi Michele, great to see you, and thanks for sharing despite pressing family matters— good health for all! Love this wreath, as kids we used to do this with gum wrappers and I've been wanting to try it again, so thanks so much for the inspiration and for sharing on Craft Schooling Sunday! More neat projects, Michele. I still love that rosette... amazing! It looks great on the frame. Lots of neat ideas!! I've been saving my rice bags for a year planning on making candy wrapper chain bags...haven't done it yet!! P.s...I love your telephone book necklace! This is such a cool idea. 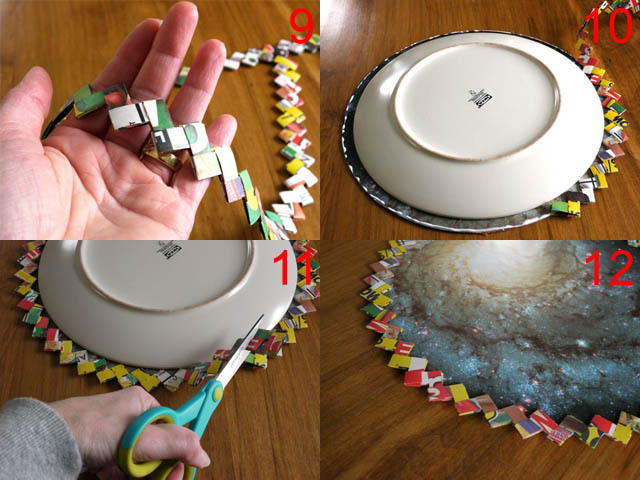 I've always wanted to know how to make these chains - thank you for the awesome clear tutorial! And those flowers are just so sculptural and pretty. I found you on Creative Jewish Mom. I love the wreath! The rosettes remind me of artichokes (in a good way). Lovely work. 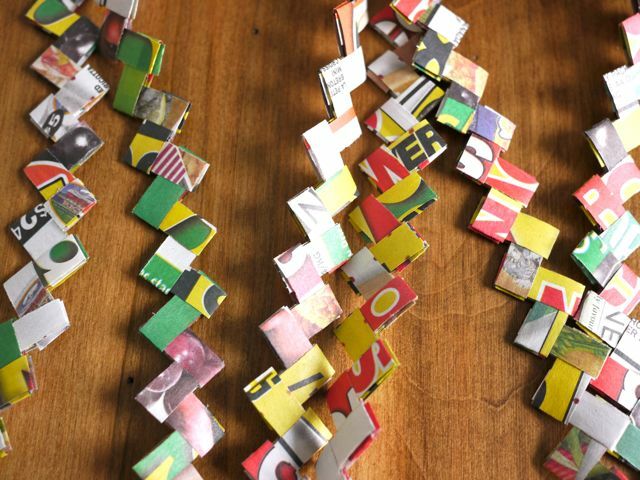 I must tell you that we made these chains from gum wrappers when I was a girl. The teen girls made them the height of their boyfriend and hung them in their rooms or rolled and hung from the car mirror. The same era that the going-steady-girls wrapped their guys' rings in angora yarn and brushed it all fluffy-like around the stone. Sweet to see this again. What a hoot!! It brought back sooo many memories. 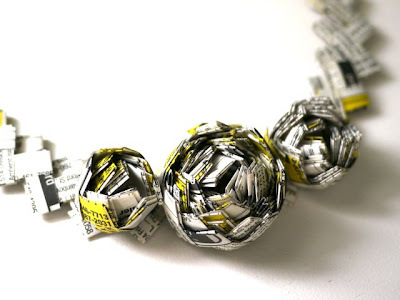 I had begun making a chain out of gum wrappers when I was probably in the 8th grade (many many MANY moons ago). It's about 15 feet long and I STILL have it along with some stick gum wrappers that haven't been used yet. It also brings back memories of the Adams gum and Zebra Stripe. It's fun to take it out from time to time and walk down memory lane.